In his 1853 essay ‘On the Nature of Gothic Architecture’, cited as the starting point for this compelling group exhibition, ‘the greatest Victorian’, John Ruskin, acknowledged the difficulty of locating gothicness at the start of the machine age. The works by emerging British and German artists curator Michelle Cotton has assembled here, to communicate a current turn back towards the medieval, also convey some of the potential tracking and cataloguing problems that might arise during such inquiry today given the complexly codified and sign-heavy nature of the visual encounter. If the curator pitches Ruskin’s analysis of gothic as the base note of the exhibition, then it’s to the late British critic Herbert Read, a champion of Ruskin, that Cotton wisely turns to frame the question of why makers through history, specifically in Northern Europe, have been consistently drawn back into the ‘dark’ period. Italian author Umberto Eco may have since popularised the expression neomedievalism (in his 1973 essay ‘Dreaming in the Middle Ages’) but it was Read who pointed out in his 1934 book Art and Industry that ‘There is no medieval treatise on art; it is barely mentioned in the whole of the scholastic philosophy as a separate category, and when mentioned, is always regarded as a practical activity’. And the romantic title of the exhibition, The Long Dark, immediately tunes one into a sense of nostalgia for a simpler time and is suggestive, perhaps, of a period lacking definition post-cultural shift: the metaphorical sidings society slides into, perhaps, when existing value structures are de-railed. While one can hardly draw direct comparisons with Ruskin’s Europe and the here and now, his concerns over the erasure of socially cohesive craft traditions and the de-humanising and disenfranchising potential of new technologies remain relevant. Especially to a world in which ‘keeping in touch’ can mean tending the virtual sheep of a ‘friend’ you haven’t seen for ten years on a social networking site’s online farm. In these screen-based, austere times one can find many reasons for the present focus on materiality, but it’s unusual to experience so much defiantly physical evidence of making in one site. It doesn’t take long, however, to acclimatise to the über-crafty surroundings and the quantum leap effect between past and present concerns. The corrupted constructivist aesthetic of Eva Berendes’s diamond-shaped sculpture, for example, brings to mind both inspirational religious architecture and aspirational metalwork designs favoured by suburban gated communities. There is something similarly totemic and humanistic about the sculptural ‘offerings’ of Maria Loboda, Alexandra Bircken and Raphael Danke. Loboda’s clay pots have been assembled like the members of a small community, each primitively worked form betraying the tactile pleasures of material play. Utopian structures and domestic life become rudely intertwined in Bircken’s woven piles of detritus – imagine the models of Cathy Wilke’s modernist architectural practice. Danke’s re-working of the matrioshka, however, invokes the same suffocating quality of his photographed magazine pages, despite being essentially full of holes. A familial, possibly modish, quality also links the strong selection of paintings and wall-based works here but thankfully does not interfere with the individuality of each art-historically referential practice. Bernd Ribbeck’s Klee-influenced eliptical motifs have been scratched and painted onto each surface yet from a distance the souped up, saturated quality of his palette smacks of the printout. Peter Linde Busk plays abstraction and figuration, and even fragments of his own works, one against another as if in search of the right formal means of expressing an internal process or an emotive state. 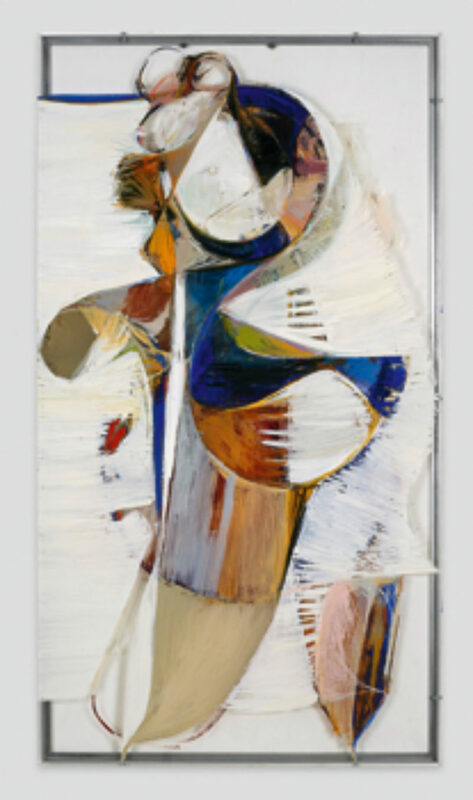 Nicholas Byrne’s highly gestural oil-on-plexiglas articulations appear like cyclonic towers offering perilous support to numerous pre- and modern-era motifs from the histories of painting and the decorative arts. A mutant militarism, a sense of formalities observed and ignored connects Simon Bill’s irreverent series of oval canvases with Kalin Lindena architectural props and interventions. Where Bill’s experiments with iconic modes of mark-making (the rave-neon dots become Fauvist disease), read like the genealogy of taste, Lindena’s coloured glass and fabric flags appear raised in celebration of improb-able material and associative unions. Kettle’s Yard is the third port of call for Cotton’s exhibition, originally conceived for Manchester’s International 3. One can sense the distance between the idea and its present manifestation and the fact that it was not originally designed for this space. Neil Mulholland has described several recent UK exhibitions on neomedievalism as ‘a lens through which we identify and justify the present in the past’. The stucco walls, meanwhile, serve to soften the critical edge of some works and illuminate the homespun qualities of others. Essentially, it’s an interesting project alliance: the highly inventive, domestically informal British-Modern sensibility of the Ede’s retreat testament to Ruskin’s hopeful notion of ‘synthesis’ between makers, objects and their environment.